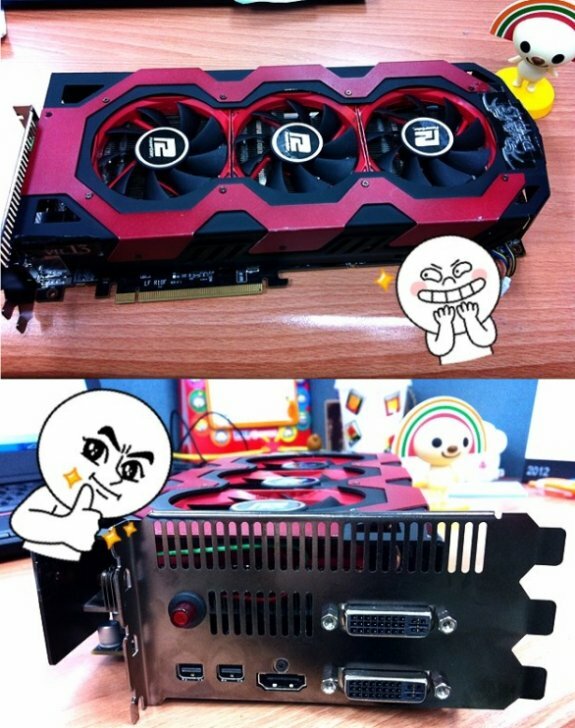 Donanim Haber published pictures of the Radeon HD 7970 X2 Devil 13 graphics card from PowerColor. This upcoming model features two Tahiti GPUs and will debut at next week's Computex show. The card features a triple-slot cooling solution with three fans and has three eight-pin PCIe power connectors. Interestingly, the card has a red button to enable a turbo mode. A big red button buried among the display outputs activates a turbo mode with higher clock speeds, but there's no word on what those are or how fast the card runs in its default config. The 7970's stock core clock is 925MHz, although a number of manufacturers are already selling 1GHz flavors. All of the 7970 derivatives we've seen come with 3GB of memory, making it likely the X2 will boast 6GB of RAM. As with other multi-GPU configs, though, only half of that memory would be accessible to each graphics chip. Sapphire's take on the Radeon HD 7970 X2 appears to be considerably different than Nvidia's design for the GeForce GTX 690. The GeForce occupies only two slots, has just two eight-pin power connectors, and relies on a single cooling fan (which does an excellent job, we might add).